This winning recipe was used by Lizzie Spillman in the Cherry Day Competition (2007) using a wide variety of fresh fruit from very nearby farms - this was an essential criteria if you were to win. Others also used local ingredients and some from further afield but everyone was praised by the judge for the quality of their entries. The enthusiasm and quality of all participants added greatly to a wonderful day. Well done (and delicious!). Ingredients - 900g (2lb) loaf tin (23cm x 10cm x 7 cm deep), preferably non-stick and with a good smooth surface. Start by preparing the fruit. Remove the stalks and halve the strawberries if you were unable to get small ones. To make the jelly, soak the gelatine leaves in cold water for 4 to 5 mins. In a saucepan heat half the lambrusco. Add the sugar and stir to dissolve. Remove from the heat. Lift the gelatine leaves from the water and squeeze gently to remove excess liquid and stir into the hot lambrusco mixture until dissolved. Add the remaining lambrusco and lime juice and allow to cool. While the jelly mixture is cooling, arrange the fruit in the tin adding strawberries first and then fill in the gaps with the other softer fruit, then add more strawberries and so on, until the tin is not quite full to the top. If you have spare fruit, reserve for a garnish. Use the best shaped fruit and mix of colour for the bottom layer as this becomes the top of the jelly when turned out. Next, pour the cooled jelly mixture over the fruit. Lay a sheet of cling-film over the surface and refrigerate overnight to set firm. 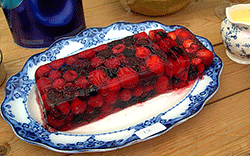 When you are ready to serve, turn out the jelly by dipping the tin very briefly in hot water and inverting onto a plate. Use a very sharp knife also dipped in hot water to cut into slices. Serve with cream.